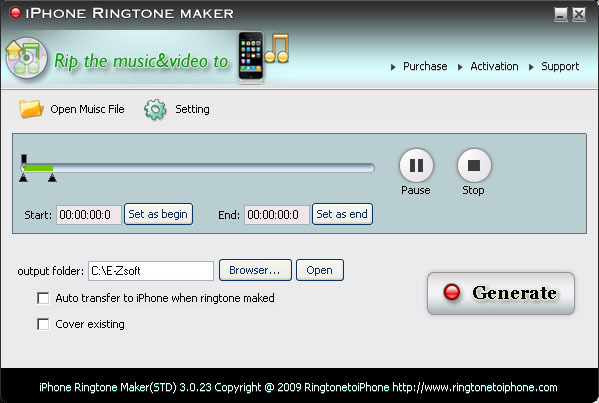 iPhone ringtone maker is the ultimate solution to custom and create ringtone and send the ringtone to iPhone directly. With this software, you can creating and send the songs purchased on the iTunes store, music files or YouTube video to iPhone easily. It supports trim input music to rip any funny audio clip by setting the start and end time. It can transfer the ringtone to iPhone automatically without iTunes. It support all iPhone tools. a solution to custom and create ringtone and send the ringtone to iPhone. * Transfer the ringtone to iPhone automatically without iTunes, you can also put ringtone to your iPhone by iTunes. * iPhone ringtone maker supports creating ringtone from mp3, wav, ogg, aac, m4a, ra, wma music files in your library. * iPhone ringtone maker supports creating ringtone from songs purchased on the iTunes store. * Supports creating ringtone from YouTube website. * Built-in music player for pre-listening before creating. Qweas is providing links to ringtonetoiphone iPhone Ringtone Maker 3.0 as a courtesy, and makes no representations regarding ringtonetoiphone iPhone Ringtone Maker or any other applications or any information related thereto. Any questions, complaints or claims regarding this application ringtonetoiphone iPhone Ringtone Maker 3.0 must be directed to the appropriate software vendor. You may click the publisher link of ringtonetoiphone iPhone Ringtone Maker on the top of this page to get more details about the vendor.